So, this just happened. 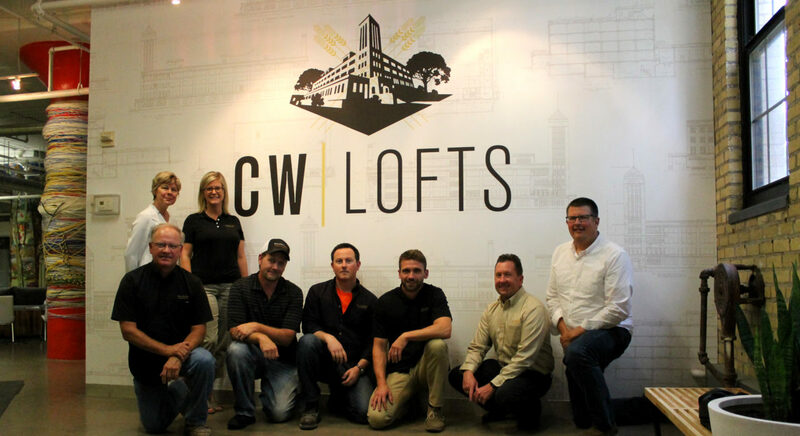 Well, actually more like a month ago, but we’re still settling in to our new space in Northeast Minneapolis’ CW Lofts. Moving from a corporate office building in Plymouth to a trendy live-work space in the city is a pretty big change, but we’ve been over the moon about it. 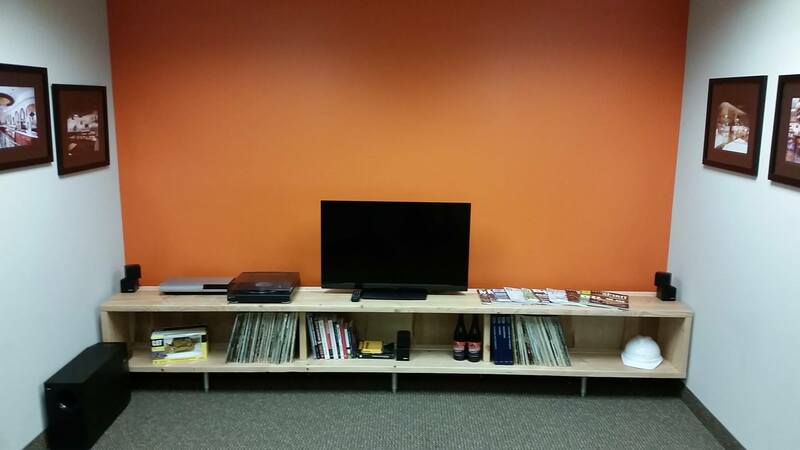 With our previous lease nearing its expiration, we saw an opportunity to pursue a longtime goal of owning our office. We didn’t want to be landlords, which meant we needed a smaller space. And since 1,500-square-foot office buildings are hard to find, we decided a live-work condo would likely be the best fit. Don’t get us wrong: we liked Plymouth, but it’s not the most easily accessible suburb in the Twin Cities. We knew that being in a city and close to major interstates would not only make it easier for our staff to travel to work and to job sites but it would also be more convenient for clients. Minneapolis, particularly the North Loop and Northeast neighborhoods, offered this perk, as well as an ample selection of the live-work product we desired. It has a ton of history and character. The CW Lofts building is the former home of the Cream of Wheat Company’s factory and headquarters. Built in 1927, the striking Moderne-style building housed the company’s cereal manufacturing process until Kraft Foods purchased it in 2002. The condos (i.e., live-work spaces) were completed in 2007. Although the building was completely renovated, many of its original features remain. Our space was the former train shed. It housed the trains that brought raw flour and grain from the riverfront mills. The rail cars were unloaded into the lower area of the building and sent up an elevator to where the top-down manufacturing process would begin. The original train tracks are visible in our floor, and our sandblasted yellow brick walls exude an earlier era. It’s close to restaurants, breweries, and downtown. OK, OK, moving to Northeast Minneapolis wasn’t all about proximity to job sites. We may also have been concerned about proximity to great food and beer. Some of the Twin Cities’ most revered breweries and restaurants are now in our neighborhood. And we love that the building’s rooftop patio offers a spectacular view of downtown Minneapolis. In our line of work, we see the power of space day in and day out. We’re grateful to be setting down roots in such a storied, authentic building and neighborhood, and we can’t wait to see how this change influences our next chapter. In the meantime, we can’t wait to show you around, so please stop by soon! Soccer Blast has long been a destination soccer complex for Twin Cities-area soccer fans of all ages. With two indoor and two outdoor fields, as well as a Player Development Center, it offers ample space for competitive and recreational sports events. But for the past 10 or so years, the dome covering the indoor fields desperately needed an upgrade. This summer, replacing it and the fields inside of it became our mission. Here’s an inside look our game plan as the project’s general contractor. Because the old dome would be replaced with an entirely new structure, the project started with a demolition. Once the dome and fields were cleared, our team got to work evaluating the existing infrastructure. We determined that the existing infrastructure needed significant modifications to support the new structure. This involved constructing large concrete beams to connect the existing structure to itself in multiple location to achieve the support the new building . We also had to install 26 helical piers to reinforce the existing structure due to poor soil conditions..
Once we completed the groundwork, Legacy Building Systems began installing the pre-fabricated building structure. The structure is comprised of fabric supported by a steel frame and sandwiched with insulation for energy efficiency. Very impressive! Although it’s technically a whopping 34,000-square-foot build, it will require fewer than four weeks to complete. When the project is finished, Soccer Blast will have a beautiful new addition to its facility that includes a 53-foot-high peak at the center of the building, brand-new turf field and, much to the delight of players and fans alike, an upgraded heating unit! With these amenities, Soccer Blast is set to be a premier location for team training, scrimmages, and league plays all year long. Our very own Paula recently interviewed one of our clients, Grabbagreen, for the MSCA March 2017 Newsletter. 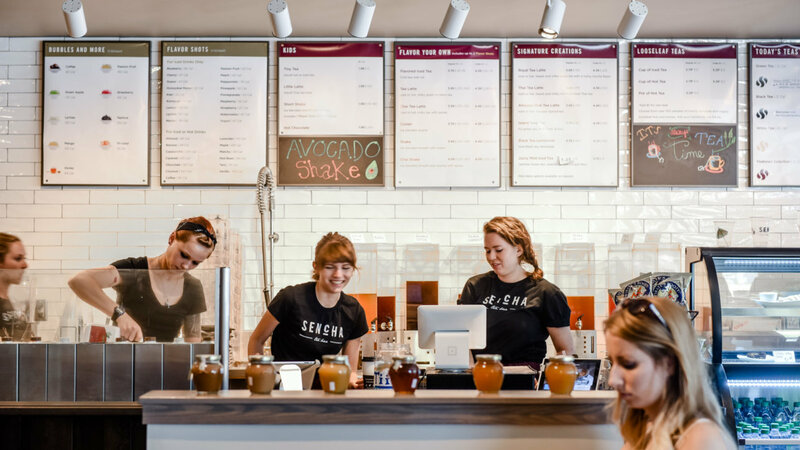 We’re proud to have our team featured in such a great publication, and learn more about the history of one of our clients – and their extra healthy food options! Check out the full interview below. PAULA: What attracted you two to the Grabbagreen franchise concept? (ROCKY) The demand for healthy food!There are currently no real options like Grabbagreen® in the Twin Cities metro area! Grabbagreen® is a fast food restaurant where great tasting, healthy food meets the speed and convenience of traditional fast food. Grabbagreen’s Eat Clean® menu is preservative-free, naturally gluten-free and GMO free. 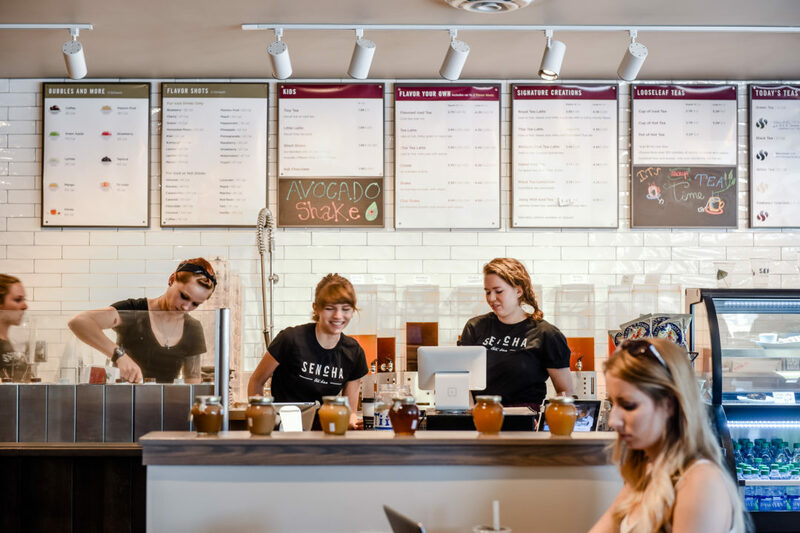 The whole food menu is based on super food ingredients and made with fresh hormone-free and antibiotic-free proteins, fresh-pressed juice, handcrafted smoothies and acai bowls, breakfast, and healthy kid-friendly items. All menu items are prepared fresh, are made-to-order. We think the timing is right for this in MN. PAULA: What made you choose the city of Edina for your location? (ROCKY) The convergence of culture and demographics. Edina is a perfect location for the Grabbagreen concept. Edina is an area that is very population dense with huge “daytime” business population combined with the Minnesota culture of health, wellness, and fitness. PAULA: What do you find most exciting about being a Franchise owner? (SCOTT & ROCKY) We have both always been on the look-out for good business opportunities that we feel we can grow. Grabbagreen franchising has just really begun nationwide. We are lucky to be early adopters but at the same time be able to take advantage of the proven systems and concept. PAULA: How did you two meet? (ROCKY) We met at Orchard Lake Elementary in 3rd grade. I think? Roommates in college. Life-long friends. (SCOTT) Not a bad guess Rocky… We met in 1976 in the 4th grade. PAULA: Are you native Minnesotans? (ROCKY AND SCOTT) Oh yeah you betcha!! We are native Minnesotans. PAULA: What is an interesting fact that someone may be surprised to learn about both of you? (SCOTT) Rocky played Junior (semi pro) hockey in the late 80’s and I was on the US Freestyle Ski team in the late 80’s and traveled the world competing for the U.S. We both need to start eating healthier to regain a bit of our athletic past! Grabbagreen will help in this endeavor. In November 2016, we implemented Procore, a construction management software designed to increase project efficiency and accountability. We haven’t looked back since. Procore does more than help us do our jobs more smoothly; it offers perks for our clients, too. Here are four reasons why you should be just as excited about it as we are. Get a project snapshot with one swipe. Our new system combines all aspects of a project into one user-friendly dashboard. With its mobile app, you can quickly log in to view project photos, status reports, and budget details from anywhere. It’s like being on site 24/7 without having to stomp around in the dirt. Work with an efficient construction team. Moving our systems over to Procore has made our team more consistent and productive. Before we moved to Procore, we used several different software applications that didn’t talk to one another. Our estimating software didn’t communicate with our accounting software, and so on. Now, all our project tools are fully integrated, making it easy for our team and yours to get the information they need. Promote collaboration. With this new program, all project stakeholders are on the same page. Everyone from subcontractors to superintendents to owner-clients has access to the same data. This is especially useful for superintendents when they are out in the field. Activities such as documentation and communication are now much, much easier – which means quicker, and more detailed, notifications and updates for you! Enjoy an easy-to-use application. The best thing about Procore, in our opinion, is its ease of use. I’m not surprised that it’s the #1 most widely used construction software; it’s high intuitive. We think you’ll agree. If you have questions about how Procore could be used on your project, give us a call. Here at SullivanDay we finally feel like we’re past the holiday blur. I think that’s partly because our holiday season started the first week of December—at the Minnesota Shopping Center Association’s annual STARR Awards ceremony, to be exact. This year, we took home a STARR Award in the Design & Aesthetics Renovation / Remodel, Exterior Retail Over 20,000 SF category for our work on the Tonka Village Shopping Center. We are incredibly honored. The project was a challenging endeavor for all involved, so ending the year with another reminder of its success was very sweet indeed. STARR Awards, if you aren’t familiar with them, recognize excellence in the retail and shopping center industry. In our award category, the judges look at a project attributes such as the “before and after” story, innovative design, construction approach, and tenant mix, to name a few. Tonka Village has been around for decades and is a favorite shopping spot among residents of Excelsior. Its renovation certainly did make for a compelling success story. When we started the project in late summer 2015, we immediately discovered challenges with the 1960s structure. The roof was failing, there were dips in the front walkway canopy, and the aesthetics were very dated. Our team hit the ground running right away. We stabilized the front canopy and replaced its columns with helical piers, all while maintaining access to the retail storefronts. Fixing the roof kept us on our toes at every step. Immediately we could tell the snow resting on it was loaded wrong and that cracks were present. Never a good sign! We tore portions off, opened up the roof membrane, and constructed a sloped roof on the back of the parapet (protective wall at the edge of the roof) to alleviate the snow-loading issue. Once the structure was sound, we went about updating aesthetics such as paint and lighting. It was truly a major overhaul, and we hope it will keep Tonka Village and its tenants around for decades to come. Receiving an award is never something we take lightly, and we are very grateful to the MSCA and our colleagues for the recognition. Like every year’s ceremony, there are so many exceptional projects recognized; it’s a great feeling to be included in the pack. Punch Bowl Social bar and restaurant is a unique food/entertainment hybrid that started out in Denver, Co., in 2012 and has since expanded to locations throughout the country. Billed as a “gastro-diner” chain with hipster flair, Punch Bowl Social offers a locally sourced menu directed by a James Beard Award-winning culinary partner, craft beverages, and countless entertainment options ranging from karaoke to bocce ball. When the chain announced it was building a 24,630-square-foot outpost in St. Louis Park, we were pleased as (adult) punch to get the call. 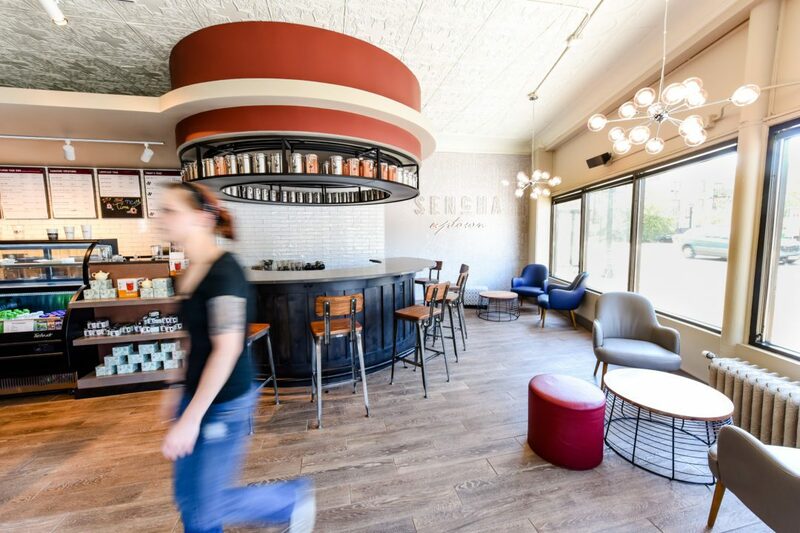 Punch Bowl Social’s construction partner is based in Denver, so they needed a local general contractor to provide onsite supervision and assist with project management—this was the role we filled. Our responsibilities included everything from coordinating with local subcontractors to developing and updating the schedule to overseeing the permit process. 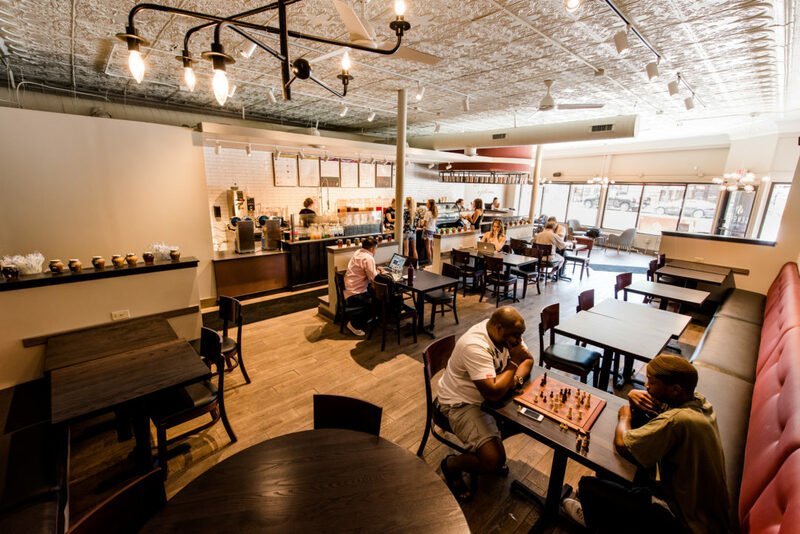 The construction work involved building out a vacant retail space to accommodate the many elements of Punch Bowl Social, including its 3,000-square-foot kitchen, 5,100-square-foot bowling area, and 1,000-square-foot bar area. Construction began in March 2016 and we were able to turn over the space to the owner in late September of the same year, allowing for a mid-October opening date—ahead of the holiday party season. Punch Bowl Social has become a favorite hot spot among fun-loving adults in the Twin Cities and it’s appeal is quickly spreading—with the help of the Sullivan|Day team. Thanks to the success of the St. Louis Park (Minneapolis) project, Punch Bowl Social has hired us to perform the same role in constructing locations outside of Minnesota, starting with Stapleton, Co., and Rancho Cucamonga, Calif.
You can’t start without a plan. Brewing beer is not “add a little of this, a little of that”; it requires a well-thought-out recipe. 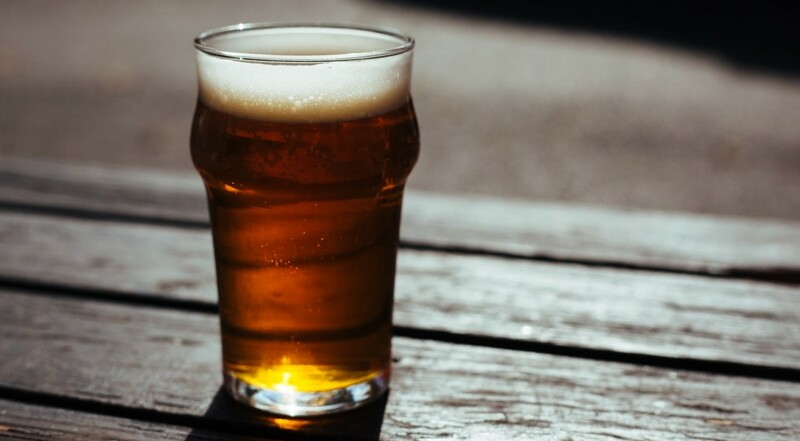 In fact, some breweries even have laboratories that break down the chemical process of their recipes to ensure it is perfect time and time again. Likewise, the first step in our process is design. While we don’t go to the lab, we do rely on architects and engineers to put together a set of plans. With these in hand, we work with a team of really smart people to make sure the project follows each one to spec. If something goes wrong during the brewing process, a brewer’s first reaction is never to toss the whole batch! They do their best to salvage the beer, which is the same approach we take when hurdles arise on projects. 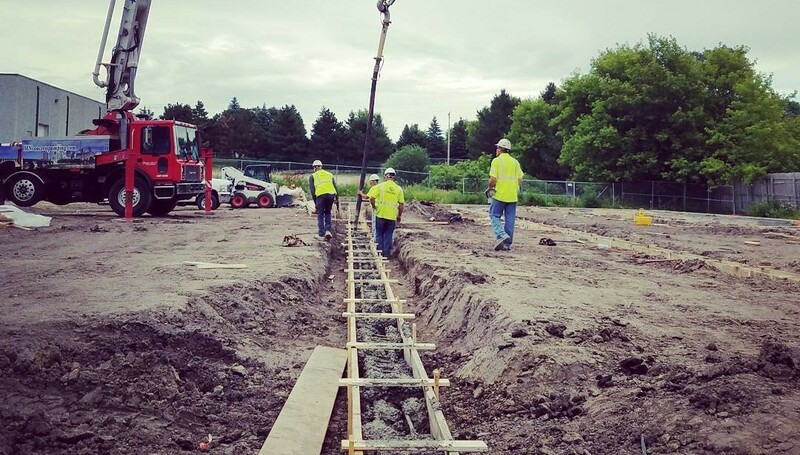 Whether it’s delayed materials, subcontractor snafus, or the good ol’ Minnesota weather, we don’t throw up our hands; we find ways to keep the project forging ahead. Repetition is the name of the game. Just like in brewing, construction essentially requires the same steps on each project. There’s a certain order we must follow no matter what. For example, we can’t install plumbing fixtures before we put up walls, just like a brewer can’t bottle a beer without fermenting it. And in both processes, there’s something new to learn every time—something that can be carried on to the next beer or building. Brewing beer and constructing buildings are two hands-on activities that give you something to show for your work. Even though I’ve been in this business for a long time, I still get a kick out of seeing a major project milestone take shape. It’s incredibly satisfying, much like our brewery friends describe the first tasting pour from a tank. But the absolute best step in brewing and construction is the very end: watching customers’ faces light up after taking a sip of your beer or walking awed clients through their newly finished building. Both call for raising a glass. 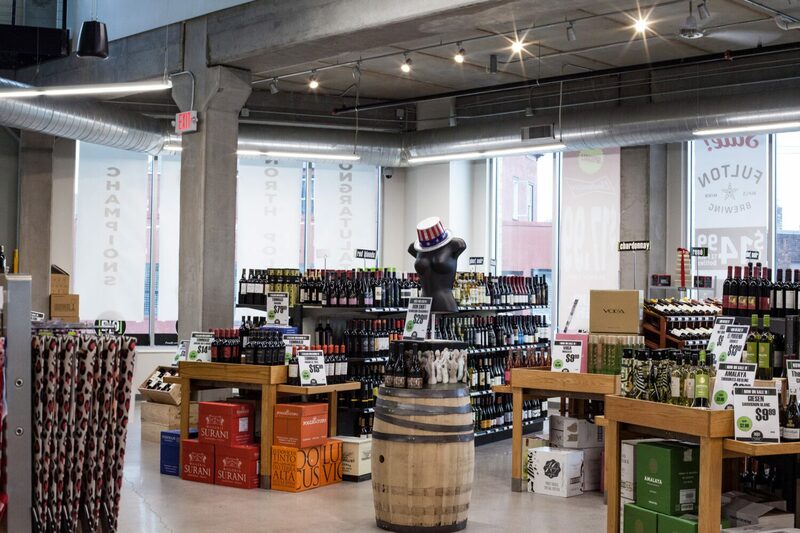 After two plus months of construction, we’re getting ready to raise a glass to the grand re-opening of Broadway Liquor Outlet, a wine, beer and spirits emporium located in North Minneapolis. Here are five fast facts you should know about the project. Broadway Liquor Outlet is a third-generation family business. Rising up in a post-Prohibition world, the Minneapolis location has served thirsty customers since 1948. From in-store tastings to a VIP wine club, you can expect top-notch service at this neighborhood institution. Their former retail space was on a city parcel that was totally wiped out by the North Minneapolis tornado in 2011. This summer, we served as the general contractor on the build-out of the brand’s new retail space—which happens to be on the same city parcel. Thankfully, Broadway Liquor Outlet didn’t have to close their doors for very long after the tornado; they’ve been operating in a location across the street for the past five years. The new retail space is in Broadway Flats. To revitalize the tornado-stricken parcel, the developer and city went forward with plans to use it for a mixed-use development called Broadway Flats. Designed to provide much-needed workforce housing in the neighborhood, Broadway Flats boasts four floors of condos atop 19,000 square feet of retail space. Broadway Liquor Outlet isn’t your typical neighborhood liquor store. The space occupies more than half—9,000 square feet—of Broadway Flat’s retail space. It’s safe to say their selection of fine wine, beer and spirits is hard to beat. Customers can look forward to shopping in a well-appointed, industrial-chic space. 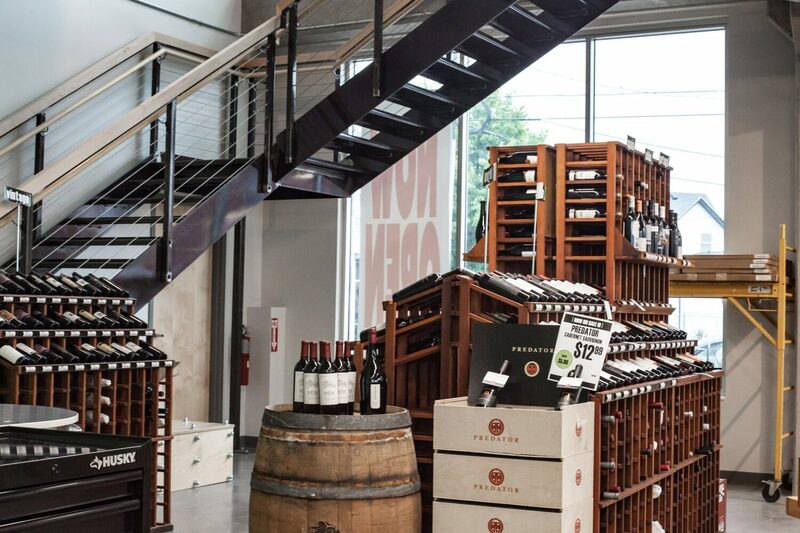 While perusing the store’s expansive selection of adult beverages, be sure to note the space’s exposed concrete and steel building structure. And don’t miss the unique mezzanine area, which serves as office space for the store’s owner. For more on Broadway Liquor Outlet, visit blompls.com. A day in the life of a general contractor: Orange you glad it’s summer? As a general contractor, we field a lot of questions; it’s just part of what we do. But lately, we’ve been getting a lot of questions about the accent wall in our office. Which isn’t entirely surprising, being that it’s bright. It’s front-and-center. And it’s, well, orange. Really, really orange. Admittedly, the shade is not a typical choice for office décor. Although it would have been fun, the decision to go orange wasn’t an artistic whim. When we rebranded last year, we felt it best represented Sullivan|Day. We’re not your traditional “screws and nails” contractor; we’re a happy, easy-to-work-with group that takes our work seriously, but ourselves? Not so much. For us, this particular color said it all. And yeah, “Day” is in our name, so there’s that, too. So, we painted over our formerly blue accent wall in February of this year, added a living room console and vinyl records (because, why not? ), and haven’t looked back since. As an added bonus, I’m convinced the newly luminous wall offset our risk for seasonal affective disorder throughout the gray March days. But with summer now in full swing, we haven’t had to worry about a lack of vitamin D. We’ve been attending plenty of outdoor events such as golf tournaments, beer festivals and even a Habitat for Humanity workday. Of course, given the nature of our business, the season has been busy with lots of “ground-up” work as well. We were especially excited to begin work on a 10,000-square-foot addition for Little Newton’s in Plymouth. Lots going on! In the midst of it all, we keep (happily) reminding ourselves that summer isn’t over yet. August lies ahead and we’re ready to make the most of it—even if the Twins lose on our annual company outing to Target Field. Before long, fall will be on the horizon. That we can’t deny. But in our office, summer will live on—in the form of a vibrant, sunny hue. For the MSCA April 2016 Newsletter, Steve contributed an article on a recent project: Sencha Tea Bar. Below is a re-post of the article. 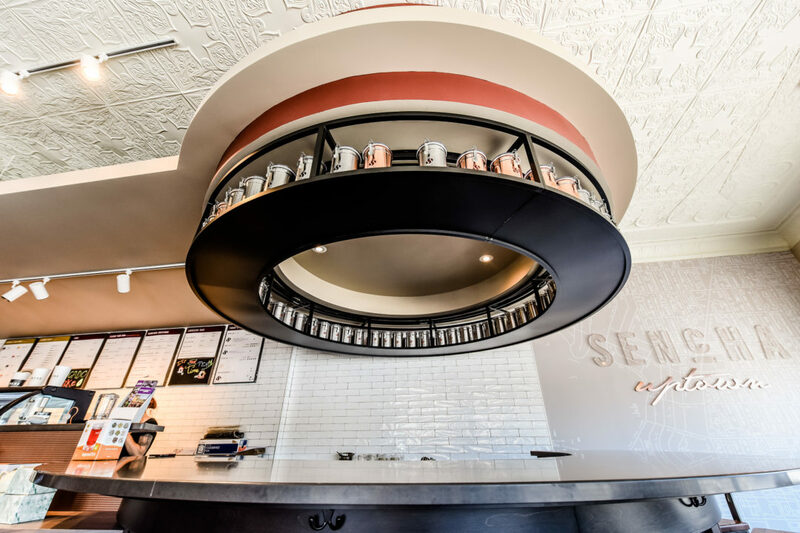 If you are looking for a change to the daily coffee or soda drive-thru routine, look no further than the newly re-branded Sencha Tea Bar chain. 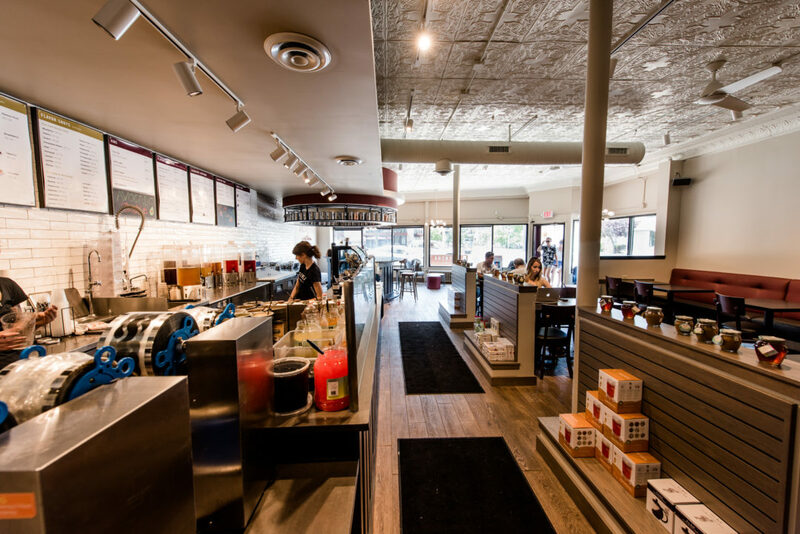 Founded in 2001 as the Tea Garden, the six store chain, with five locations in the Twin Cities and one in Madison, Wisconsin, is nearing the completion of the brand makeover. Sencha Tea Bar is a locally owned, family business which allows guests to experience “your tea, your way.” The management team partnered with the design firm Shea, Inc. to design a prototype store that would expand the existing customer base and increase traffic during the earlier day parts with a renewed focus on loose leaf tea. The Uptown location was chosen to be the first to undergo the transformation in the Spring of 2015. 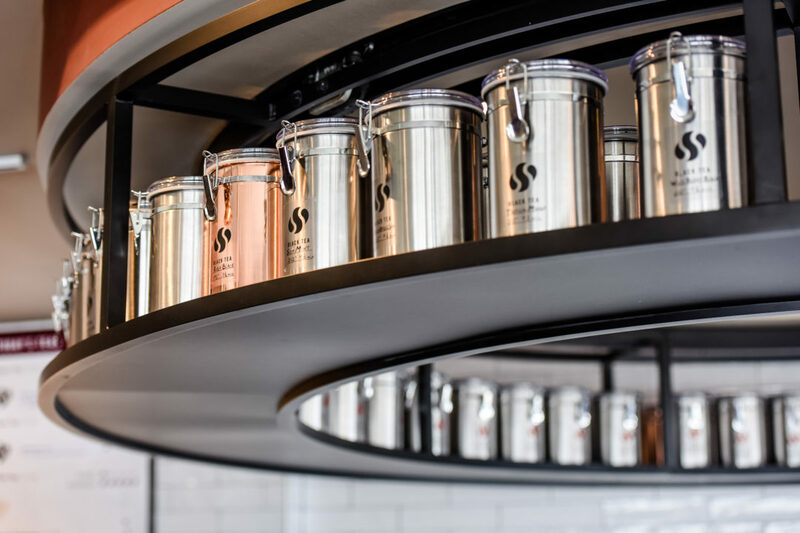 One of the signature components of the new design is the rotating tea rack over the bar that contains over 125 different canisters of loose leaf teas. A variety of seating options are available, from comfy lounge seating to stools at the bar, most in close proximity to an electrical outlet and a USB charging station for your laptop and phone. The new fixtures and finishes create a simple, yet sophisticated atmosphere for the new tea bar experience. Along with the new name and new look are new menus and products to sample. The award-winning drinks range from colorful, tropical bubble teas to a global expanse of traditional loose leaf teas. 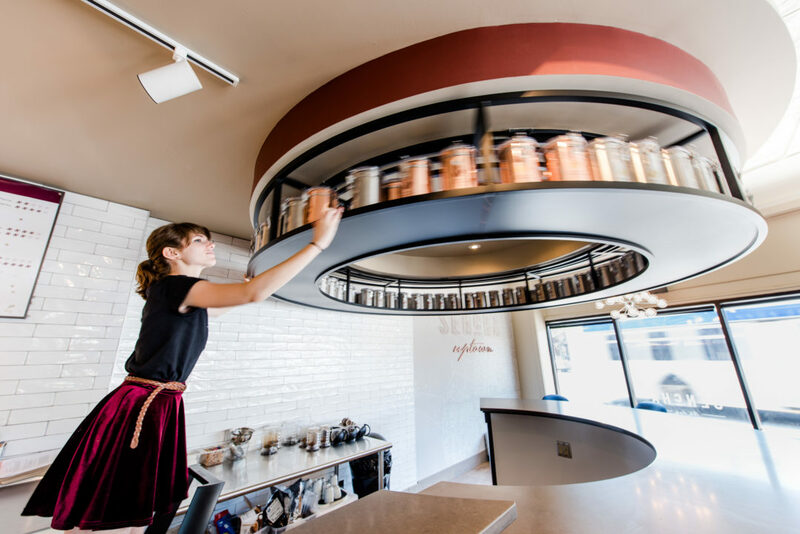 You can cozily sip your favorite drink at each of the tea bars, or take home any of the expansive list of loose leaf teas, and become your own tea master at home. There are delicious food and snack items to sample as well. 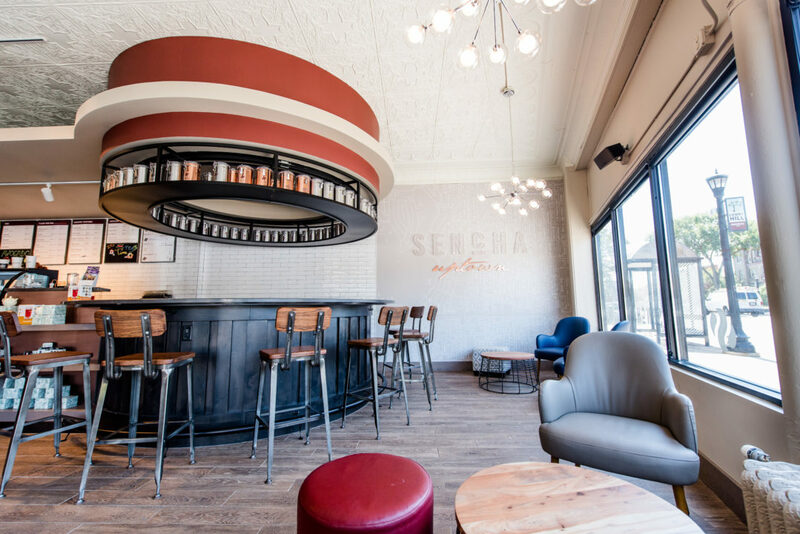 Whether you need your morning beverage to get you going or a place to hold an afternoon meeting, Sencha Tea Bar now offers a more interesting option than the corporate coffee guy on the corner. 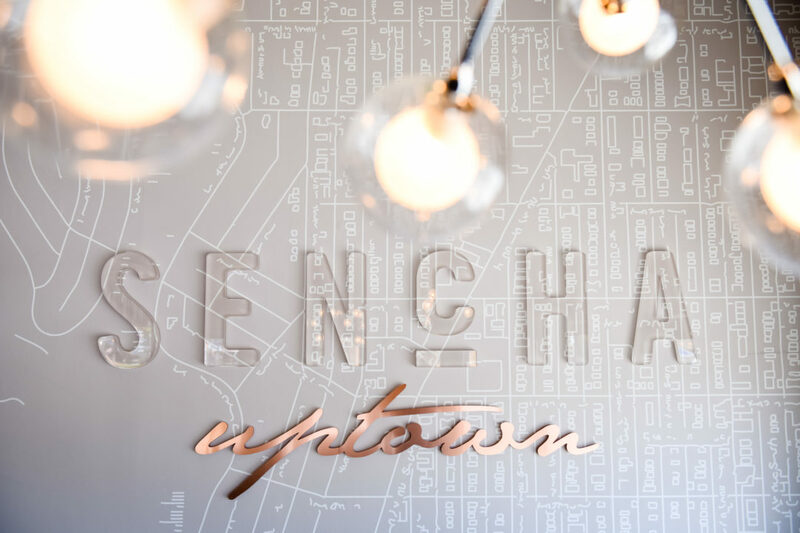 Sencha Tea Bar – It’s Tea Time.